Toby is a one year old neutered male Border Collie mix. He is a good dog, but is active like a puppy. He loves puppies and other dogs. We had him in with 6 puppies at one time and he loved them. Toby is around 1 year old the vet thinks. He is pretty and a good dog. He will need to be enrolled in obedience classes as he is all play, plya, play! He will be good for an active family, with older kids, that likes the outdoors. He does like attention and likes to be played with. Cecilia was rescued from a woman who was abusive to her and didn't feed her well, so she is 20-30# underweight. Her hair was matted and dirty and she had parasites. She has been bathed, brushed and dewormed. She is not crazy about being bathed....probably the first bath she ever had! She looks good now...except for being underweight. Good food will take care of that! Cecilia is very friendly with strangers and seems to have a sweet personality. The lady who surrendered her said Cecilia is good with other dogs and ignores cats. She loves to ride in the car, bt she decides where she's going to sit and sometimes that's in the driver's seat, so please be large breed experienced. She's a LOT of dog. But very loveable. Medical: She has a junior cataract in her left eye. Our holistic vet gave us some medicine to dissolve the cataract and we are seeking an adopter who is willing to go the holistic route with both eye meds and a proper diet. Raw feeders will be given preference, but this is not a requirement. 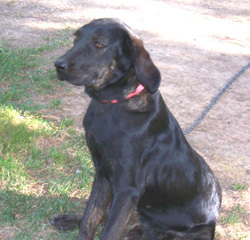 Baloo is an active, affectionate, people-centered, seven year old lab-mix; he loves and is very devoted to his people. He is excellent with toddlers and babies and is very gentle and has been totally safe with his growing family's little ones. He was adopted from a shelter in the South, and grew up companionably with an older female dog, but would need to be resocialized around new dogs as he has been the only dog for awhile. He LOVES to swim as you can see from the picture. He likes camping and just hanging out with his people. They feel he would benefit from a more suburban or rural environment. He is not totally at ease in the city and gets overly-excited by strange dogs walking by his house all day long and it's taking a toll on his state of mind. 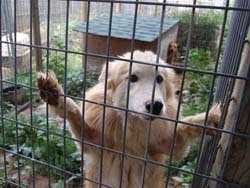 His people are close friends with Save A Dog and have been very responsible dog owners. We've known this dog for a long time and can attest to the fact that he has had excellent care. But with a toddler and a new baby, they are limited in the socialization and exercise they can provide him. 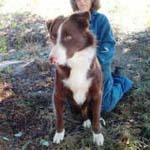 The general consensus is that he would be happier in a rural or suburban setting where he is less confined and can get more exercise and proper socialization with other dogs. He is a very healthy dog and still has a lot of good years left to enjoy the outdoors with his new people. This is a very tough decision for his current owners, but we feel it is the right thing at this time for Baloo. Please be loving and understanding and extremely commited to dog ownership and its responsibilities. Carson is a gorgeous 9-10 month old Golden Retriever/Spaniel mix. He is rusty red with blonde highlights and is a real looker. He has a nice calm personality and is extremely submissive. 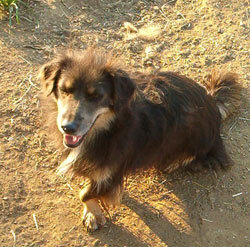 He's shy in new situations, but will warm up and is very playful, both with dogs and people. He loves a belly rub! He plays with toys, balls, and rope toys, but his favorite thing is to be outdoors just enjoying the sights and smells. He loves water and will play in his water dish. He likes to run, but is not very leash trained. A fenced in yard and some dog training would work best for him. He is extremely gentle and sweet natured. He's not wild about the crate, but will not howl once he's in. He's very quiet. He is great in the car, quiet, calm and never car sick. All around he's a great dog for most any situation. We're going to choose the people who have the most time for him as he deserves it. He is large boned, solid. Not a large dog, but solidly built. We would love to have him go as an only dog or with dogs his own size/age or older. He doesn't like puppies near his food bowl and we think that's because he was so emaciated when he was first rescued. Nevertheless, we always try to play on the safe side so that his next home will be his permanent one. 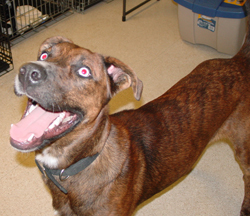 He is an awesome dog who deserves a great home! 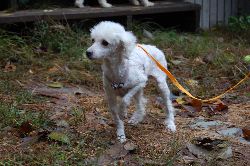 Chatty is a 3 year old toy poodle who came to us very timid. She was raised in a kennel environment so it has taken her awhile to come out of her shell, but she is a loveable little dog. She weighs about 6-8 lbs and is a darling of a dog. When she arrived from her breeder (who fell ill and had to give up her dogs), she was matted, so she is shaved and will need little coats. W'e're looking for someone with a bit of patience, who would love a little lap dog. She is not for a household of kids, but would be fine with visiting grandchildren. She is never nippy, just shy. Someone willing to socialize her slowly who wants an indoor dog (she is paper trained). She has many puppy behaviors still, like she will get into things. She is starting to blossom in her foster home so we'd like to move her to her new home before she gets too attached. She will not be at our meet and greet events, but can be seen in her foster home once we have reviewed your application. She is fine with dogs and cats. Not raised with children. 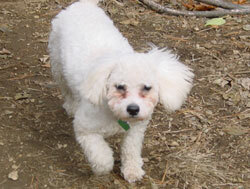 Chester is a 7 month old male Malti-poo who was given up by his owner. He is a cte pup, playful and very sweet. He is crate trained and working on house training. He gets along with everyone and is a friendly dog. He wants to please and he loves to play. He is about 10 lbs or less and is nonshedding. 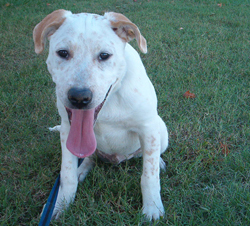 Freckles is a 18 week old yellow lab mix pup. He has some red spots, hence his name Freckles. He is very submissive, happy, playful, listens well and doesn't need harsh corrections. 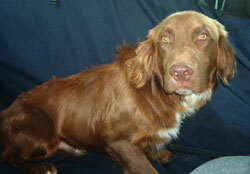 He would thrive with a family and especially with another dog as he loves to play with all dogs. He is gentle with children too. He loves affection and attention and loves to sit in your lap. Please be someone who has time for him. He is crate traine and doing well with house training too! 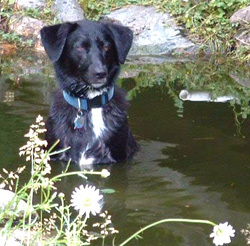 Laddie is a very sweet and gentle and quiet 10 year old Collie mix who has lived outside for the past 8 years at a humane society in a very rural part of the country. His coat is matted and we will rectify that, also he recently had a dental so his teeth look nice and clean. He has the little bounce in his step like a collie and his back end is total collie all the way. He is mixed with something small as he is small for a collie, more like a medium build. He would be the perfect companion for a senior or a person who really wants to save a dog. He deserves a chance. Thank you to all his sponsors who helped us to pay for his dental, bloodwork, and his trip up to Massachusetts. He is great with other dogs, but will chase cats, so no cats, please. 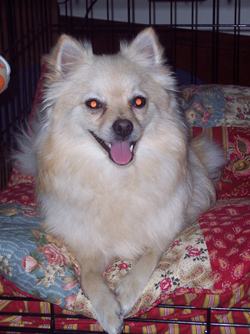 Lola is an adorable blonde 3 year old female Pom who lost her home due to divorce. She is a total delight, friendly, joyful, feisty, and playful. She is a rare find and will be an awesome dog for the right person who has time for her. Please apply by clicking on the How to Adopt link on our Web site, then we will contact you. Molly is a sweet, 25-30 lb Sheltie mix who has Dachshund-shaped legs. She is the gentlest, kindest dog you will ever meet. Please be someone who has time for her. She is housetrained and affectionate. She loves balls and toys and is obsessed with her nylabones. You won't see this in the beginning as she is shy at first. She will warm up and be a wonderful dog for someone. She loves the outdoors as she was kept as an outdoor dog. We feel she deserves a soft, cushy bed inside, only to go out when she wishes. She is a quiet dog, so she is a watered-down Sheltie, not a barker that we can see. In the summer she loves to lie in the kiddy pool. She is a happy, playful, easy little dog. Shadow, one year old Lab mix 55-60 lbs spayed already. Good temperament, great with everyone. She walks well on a leash now and listens well. She is young, so will learn more than her sit and no commands quickly. She loves other dogs and has not chased the cats. She is full of energy for walks and loves to play with her toys. 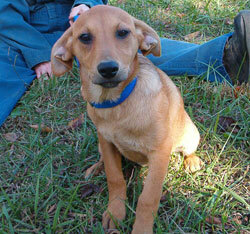 Sparkles is a 16 week olf Lab/Beagle mix. She is firendly and playful and full of fun. She will be at our Meet and Greet on Saturday, 11/10/07 from noon til 2 at Petco Natick. She is crate trained.